The following guest post was written by a friend who is also a diocesan priest. I recently inquired as to why so few priests offer the Novus Ordo Mass ad orientem, despite numerous books and articles in recent years stating the case for it on both historical and theological grounds. The following post is Father’s response. His only request of me was to have his anonymity maintained, which I have honored. It is my hope that many priests will read Father’s post and prayerfully reconsider liturgical orientation within the Mass and it’s spiritual implications for all of us. Since Ordination as a priest, I’ve offered the Novus Ordo Mass ad orientem on a few occasions — side-chapels on visits back to the seminary, or side-chapels at a Basilica in Rome, or a private Mass on my day off, with the altar settings “reversed.” Never once has it been at a public parish Mass, either during the week,or on a Sunday. Ordinarily, I offer Mass using the “Benedictine arrangement” in my parish. My pastor doesn’t seem to mind, nor do any of the faithful. I consciously look up at the people only when the rubrics call for me to face them, at the beginning, the Orate Fratres, the Pax … Most of my attention is on the Missal, accompanied by, as best as I can manage it, an interior effort to intentionally unite myself to the sacred action unfolding at the altar. Each time I’ve offered Mass ad orientem, that same feeling has resurfaced. “This is right.” Dignum et iustum est! Fr. Uwe Michael Lang gives a thorough history of orientation in the sacred liturgy in his eminently readable “Turning Towards the Lord” (Ignatius Press, 2009). Turning the altar around is, materially speaking, not a big deal. Move the candlesticks, the missal stand. Make sure there is a prominent crucifix in the sanctuary that will serve as a focus for the faithful and the celebrant. The servers will need only the most minimal of, well, reorientation. The Liturgy of the Word can be offered facing the people (which certainly makes a lot of sense). However, say the offertory prayers facing the Lord, together with the people. Offer the Holy Sacrifice facing the Lord, together with the people. Well, why not? The rubrics presume that the Mass will be offered ad orientem. Absolutely nothing in the law prevents this. So what is the problem? I really do not think the faithful are a hurdle. If they trust their priests, if their priests love them, and they know it, they will listen. Sure, some, the more ideologically hidebound, will protest. But, as they say, one cannot please everyone. The real hurdle lies with my brother priests. Of course each presbyterate is different, and the Church in the US, in general, has tacked much more towards tradition and orthodoxy in recent years, than many other parts of the world. Yet, the idea that one should be offering Mass ad orientem is still considered taboo. Is there any American prelate who does this as a matter of course? 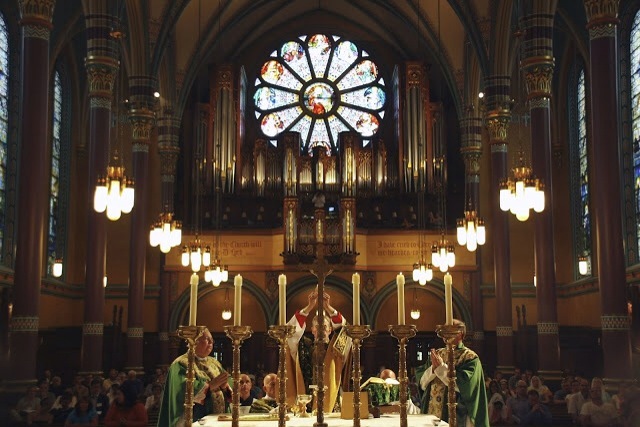 Moreover, it cannot be denied that even until fairly recently, liturgical formation has been marked with a strong sense of “rupture” rather than continuity with the liturgical tradition of the Church. Priests ordained even within a decade ago, do not seem to see the importance of a sense of tradition. Liturgy is not “their thing” as one would say colloquially. Besides, there’s so much to occupy one’s attention in the parish! For my older brethren, this was one of the nostrums they were taught: the Council enacted this change to bring an arcane liturgy closer to the people, to make it more relevant, to increase active, conscious participation.In many presbyterates, pushing for this change will invite opposition. One will be marked. Furthermore, I do not think the healthy attitude is simply, “Wait till I’m in charge.” As it is there is a tendency for each parish to be run as an independent fiefdom. A stronger sense of unity, of the common life, of fraternity, of being part of a presbyteral brotherhood, of “having the same mind among yourselves as Christ Jesus” (Phil 2:5), is sorely needed in the diocesan priesthood today. Isn’t our unity the evangelical sign for the world (John 17:21)? Is the exercise of dominating power the only way to move ahead? Isn’t that one of the things that has led to our current situation? Certainly, offering the Holy Sacrifice versus populum is not inherently evil, even though the fruits of this innovation have been quite deleterious. However, if the goal is to really recover a sense of the sacred, and a true “spirit of the liturgy” that Cardinal Ratzinger so beautifully described in his magisterial work by that same name, then a widespread change in mentality, in priestly culture, has to come about. And that recovery, rooted in the authentic spirit of the liturgy, is an important condition for a more fruitful celebration of the Holy Eucharist, a more fruitful, conscious and active participation at the Holy Sacrifice by the faithful, and a more reverent and fruitful reception of Most Holy Communion (nowadays a near universal routine in our English-speaking congregations), so that the Holy Eucharist is not simply a ceremony that has no bearing on the rest of life, is not “intrinsically fragmented” as Pope Benedict wrote in Deus Caritas Est (14). Celebration ad orientem is a crucial part of this recovery. This recovery of the spirit of the liturgy is indeed a central part of the New Evangelization. A necessary part, though a minority viewpoint sadly. Yet frankly, I have not sensed that this is the central issue, for so many of my brothers. First of all there has to be a serious commitment to all that the priestly life entails in general (fidelity to prayer, sacrifice, penance, mortification, a zeal for souls, pastoral charity, spiritual direction, continued intellectual formation, a spirit of obedience and humility). Each of us priests has to seriously discern the will of the Holy Spirit in his own context. How will I aid this movement of recovery in my corner of the vineyard? How will I, lovingly, teach my people about this? Do I pray for the gift of courage to listen to Him and follow Him? What does He ask of me in this regard? Of course, for a movement of recovery to gain steam, one needs a critical number of like-minded priests, and, certainly, supportive bishops. Even where this is present, however, one has to really embrace the Cross. Am I willing to suffer patiently, even from those within the Church? Not with some kind of melodramatic martyrdom-complex, but with the true embrace of priestly victimhood, always trusting in the Bridegroom of the Church, who has guided, and continues to guide, His Bride through all the vicissitudes of her earthly sojourn. Liturgically minded priests will have to be priests who are willing to suffer for the good — the ultimate good, the eternal good — of their people. Liturgical reform and recovery, cannot simply be an aesthetic agenda, or one that relies solely on the exercise of dominating power to achieve its goals. Victim priests who lovingly suffer for their flock. That is, after all, the real spirit of the liturgy. Posted on September 4, 2014, in liturgy and tagged ad orientem, fr uwe michael lang, novus ordo, spirit of liturgy, versus populum. Bookmark the permalink. 30 Comments. They don’t do it anymore. Now that Fr. Fanelli and Padre Juan Carlos are gone, Fr. Matthew and Msgr. Richard will not do Ad Orientem Masses. I can’t stand that some people complained about a reverent Mass. Appalling! I showed Fr. Matthew a letter talking about Masses done Ad Orientem and he said until he gets a letter from the Bishop, he will not do the Mass that way. What a shame! Time to come on over to the Instiute. Would that “ad orientem” Masses be more popular! Our parish church, like many, has a magnificent high altar which now serves as a “backdrop” or display area for tons of flowers, the actual “functioning” altar being a free standing boomerang shaped thing that was installed in the early 70’s. The rich symbolism of “ad orientem” aside, how many of us would announce a formal dinner for the President of the United States or the Queen of England, have a richly appointed head table for them in a special position in the dining hall, but then make them eat while sitting on a folding chair at a card table, set up in front of the actual head table? I think of this almost every time I attend Mass and see little “altars”, with glorious, unused high altars behind them. Could be worse I guess. My mom’s childhood parish ripped out and destroyed a Gothic Revival high altar and replaced it with a white wall and an abstract sculpture that looks vaguely like a crucifix. At my tiny little parish in the middle of nowhere in Canada our pastor has recently started offering the Ordinary Form Mass ad orientem on occasion. It is a mid-1800s country church, but we do have an old wooden high altar with tabernacle available, and Father uses this. It probably amounts to about half the time, but it never occurs regularly. He also varies all the parts where there are different forms given as options—introductory greeting, penitential rite, Eucharistic prayer, memorial acclamation. He does this on purpose, explaining in one homily that he wants us to experience the full range of options the Missal has to offer. Will it normally be the case that parishes offering Mass ad orientum will be doing so in the context of the Latin Mass? Great article. Normally, yes. However, there is nothing preventing a priest from offering the Novus Ordo ad orientem. The liturgical history of Catholicism, both the Latin Rite and the eastern rites, is one of nearly two thousand years of priests offering the Holy Sacrifice facing the altar, also considered the liturgical east. For those who frequently (or exclusively) assist at a traditional Latin Mass, ad orientem is the norm and makes perfect sense. Thank you for your question John and for reading my blog! Having moved to South Florida, we had a tough time finding a new Church. We experienced clapping, swaying in the pews, Sign of Peace crowds in the aisles kissing, hugging & laughing aloud, drums, horns, guitars, sax, ad naesueam, at 2 different churches. Then we found a smaller church whose holy Pastor offerred the main Sunday morning Mass ad orientem, with the Gloria, Sanctus & Agnes Dei sung in Latin, Traditional hymns, with full incensing, and kneeling for Holy Communion on the tongue. While not a Latin Mass, this is the closest we can find in 3 counties in South Florida. Heavenly! Thank you Father James! Reblogged this on Faith in our Families. Love your blog Clare. God bless! Jewel E Brennan As a Latin Lover, one who studied 4 years of Latin in High School and two more semesters in college, I can appreciate the Latin mass. I am also a doctoral level theologian and know that Vatican II never “dismissed” Latin as still being the official language of the Church. However in their wisdom, thousands of bishops also knew that ordinary people don’t have a deep education in Latin and needed to more fully participate during the Liturgy in the languages they know. That is why the Church has a treasury of liturgical rites to offer us. One is not better than the other… this is not black and white but the deep wisdom of our bishops in communion… asking in Vatican II’s Sacrosanctuum Concillum (Document on the Liturgy) everyone, both clergy and laity to “more fully participate” in the liturgical rites. How can this be done (and it wasn’t as I am pre-Vatican II) if one doesn’t know the language of the prayers? The mind leads the will. If the mind doesn’t understand what the lips are praying then how can it lead the will and the emotions? Two other points: One big problem that bothers many of us is when a priest as presider starts mixing apples and oranges, that is celebrating mass half English, half Latin, and half of the gestures of the Laitn Rite and half in current vernacular. That is truly not what was intended by either the Vatican II or Pope Benedict. The rubrics call for one or the other not a hybrid developed by a local priest who thinks he knows the Novus Ordo and keeps what he likes and throws out the rest in either liturgical form. I have seen this done with confusion both to celebrant and congregation and the last time I walked out. Finally, if one studies ancient Hebrew and Greek as well as Latin and reads the bible in those ancient languages, you will come to realize that Jesus DID NOT PRAY THE FIRST MASS IN LATIN BUT IN ARAMAIC. The argument is we need to go back to the language of the early Church…and if one does then one needs to learn and pray in Ancient Aramaic, the common language of Jesus and the Jews when Christ was here on earth. If you have never studied ancient Hebrew you will not understand how incredibly difficult it is to read, speak and pray in the ancient languages. The only rite that is in Aramaic and has been approved continously by all the popes for 2000 years, is the Maronite Rite (Bishop St. Marion who hid in Lebanon with his people when the Romans were persecuting the Christian and why it is referred to as the Marionite Rite). It is beautiful to hear at the consecraton the exact syllables that Jesus used at the last supper. There are Maronite Rite parishes in NJ and Philadelphia and it might be worthwhile to attend one or more of those beautiful liturgies. ONE FINAL POINT: HAS ANYONE EVERY SEEN A PICTURE OF THE LAST SUPPER WITH CHRIST TURNING HIS BACK TO THE APOSTLES? If you have let us know and let us know if it is historically authentic. Jesus faced his disciples at the last supper! The priest represents Christ at the Eucharistic liturgy. Read more of Pope Benedict and he will tell you about this and why, whenever possible the priest (like David of old, the prefigure of the Messiah King) faced east when it was time to pray… Christ is the rising Son and that is the reason. Pope Benedict gives a beautiful explanation of this. So let’s stop arguing about what rite is better or worse. Let’s realize the Church in its wisdom offers us much from its liturgical treasury and one jewel is not better than another! heart emoticon angel emoticon Eileen Mechler please share this with your anonymous priest writer. I know Hebrew, and it isn’t at all difficult to “read, speak and pray” in Hebrew! Have you never been in a synagogue? Yes I have. I have an uncle (Rubin) who married a Catholic and was disowned by his Yshevia sect but then became reformed. The son was raised Jewish and the girls Catholic and I attended his bar mitvah and weddings – one of the girls married a Jewish fella! I also studied at Seton Hall University the only university in the world offering graduate degree in Judeo-Christian studies. You may not find Hebrew hard to understand or pray in but you are the exception not the ordinary Catholic in the pew… You are blessed as a I to have the deeper understanding of our JudeoChristian roots! Well, yes I know few study or know Hebrew. I might have misunderstood your post: I thought you were saying that if one studies Hebrew, one finds out how hard it is to read, speak and pray in it. And I just wanted to assure people that actually no, it’s not. Don’t be put off. Most of what you say here is puerile for someone who is on the path of a Ph.D. theologian. Just one example: so Jesus said the first mass in Aramaic, not Latin. If this is an argument for the use of English [or any other language] in the Mass, it breaks my heart to hear it from a budding theologian. “Liturgically minded priests will have to be priests who are willing to suffer for the good — the ultimate good, the eternal good — of their people.” This is what it means to be a Father, a good father who loves. Surely in my morning offering when when I pray for for priests, “for all those who hold and teach the truths of the Catholic Church”, you are among them. God bless you and may the holy angels guard and protect you from the wolves as the years go by. The same priests that understand this will teach the truth about marriage because they understand the demands of Love. Thank you for your comment Lynette. Indeed, the priest who wrote this guest post is one of the good ones who takes his vocation very serious. Those who know him are blessed. I was received into the Church on Pentecost 2013 after 4 decades of happy Pentecostal allegiance, in St Birinus, Dorchester, UK, where every Mass is ad orientum. It’s what has been normal for me from the start. Occasionally I’m elsewhere and the priest faces me: it’s distracting and makes him and us the focus of attention, not God. I just can’t understand why the best minds and leaders in the Church voted for this change, which clearly detracts from the power and meaning of the liturgy. Coming from far outside, maybe that was easier for me to see. Thank you for your comment John and welcome to the Church! I agree: often it is the adult convert who can see more clearly on these matters. My priest said the ‘Our Father’ Ad Orientem when he came to the parish, but no longer. I miss it because it did look more reverential. Pardon my tardiness, just came across this post via Joseph Shaw. As a priest who offers occasional daily Masses ad orientem and every Mass during this Advent. One thing I would add to Father’s article is the need to engage his brother priests on a friendly level. If we younger priests are to overcome this challenge it must be through friendship with our elders. In my own preparations to move this way as a pastor, I engaged the other priest in town to inquire about his experience of orientation during the 70s. I shared with him my theological and spiritual understandings of orientation. While he may not fully understand, he doesn’t raise a stink, because he knows I’m a friend and he know’s I care for souls. Now, if you have an elder brother as a priest who won’t listen to friendship and reason. Well, in that case, there isn’t much you can do other than beg in faith for our Lord Jesus to move mountains. I have a good friend who is a priest who prays the NO mass Ad Orientem on 1st Friday’s, 1st Saturday’s, on special occasions, and on youth retreats. It is nice to see him do this. I know he gets push back from many of his brother priest for doing this. I find this sad. As he has said in the past, Would you prefer the bus driver to face you or lead you forward by his example as he drives the bus to your desired locations? I personally go to the Cathedral of Our Lady of Walsingham the Cathedral parish of the Personal Ordinariate of the Chair of St. Peter, where Mass prayed Ad Orientem is the norm. I began going there not because I am a Anglican convert but because I found that the liturgy was more in keeping with my traditional leanings without being the TLM, which I will say is also available in my area. I am truly blessed to have the opportunity to experience many of the different rites of the Church in my area. But I deg res. The three Ordinariates in the world have our own liturgy approved by Rome so we do not use the NO liturgy or TLM but our own special liturgy. I believe that in our rubrics Ad Orientem is a requirement because all of the ordinariate parishes I have attended have also prayed the Mass Ad Orientem. We also all have alter rails and receive on the tongue after intinction. These truly Catholic elements make me feel at home in this parish. When you walk into our cathedral you know it is a house of God from it’s stain glass to it’s stone foundation. You would never imagine that the church building was only built 13 years ago. Sono un sacerdote italiano della Diocesi di Bergamo. Nela Santuario di Sombreno io celebro da tempo versus orientem con il novus ordo, invito i fedeli a ricevere la comunione in gionocchio e sulla lingua, e ho recuperato anche la lingua latina durante la Messa. I miei criteri si ispirano alla “riforma della riforma” auspicata da Papa Benedetto XVI e sostenuta dal Cardinale Robert Sarah, Prefetto della Congregazione per il culto divino e la disciplina dei sacramenti, ossia una liturgia che usi abitualmente il messale riformato da Paolo VI (non è necessario tornare per forza alla liturgia antica), ma che recuperi il primato di Dio, il senso del sacro, il decoro, il silenzio, il giusto clima spirituale che, meglio garantiti nella liturgia antica (questo sì) e in quella monastica, sembrano invece assenti o comunque secondari in molte delle nostre celebrazioni. Il fine è di riportare la liturgia alla sua natura più autentica, quindi non è un “tornare indietro” nostalgico, ma è restituirle ciò che le è stato sottratto e che la identifica; è riconsiderare la liturgia come fonte di spiritualità, come sorgente e cuore della preghiera della chiesa. E, come ho detto sopra, sono tre gli accorgimenti liturgici che ho ripristinato spiegandone ai fedeli le ragioni dal punto di vista teologico e liturgico: l’altare “orientato”, il recupero della lingua latina e la Comunione ricevuta in ginocchio dai fedeli. L’auspicata e urgente “riconciliazione liturgica” o “riconversione liturgica” può essere raggiunta concretamente, con pazienza e perseveranza, anche attraverso il recupero di alcune forme tipiche della plurisecolare tradizione liturgica monastica, quanto meno di quel monachesimo non snaturato e deviato ma autentico e radicale.